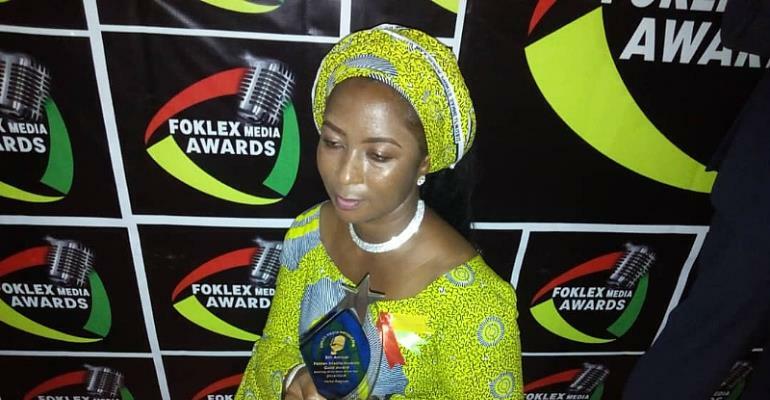 Gateway Radio’s Christiana Ativi has been adjudged Best Morning Show Host of the Year in Oti Region in the 8th edition of Foklex Media Awards held on Saturday, 13 April 2019, at the National Theatre in Accra. The awards scheme organised by Foklex Media Production was aimed at recognising personalities who excelled in the media space in the year under review. Speaking to thepressradio.com after the awards ceremony, Frank Akwasi Owusu, Chief Executive Officer for Foklex Media Productions indicated the resolve of the team to extend the awards to cover categories for the sixteen regions of Ghana. He expressed the satisfaction at the turn of events at the 8th edition Awards ceremony which captured seven regions of the country. He rallied the corporate world to come on board and sponsor the event which is aimed at rewarding hardworking professionals in the media industry. Receiving the award, a veteran radio personality Christiana Ativi thanked the management of Gateway Radio and the people in the region for the support and encouragements. “I thank everybody for their immense contribution towards my top accolades at 2019 FOKLEX Awards. I promise to work hard to maintain the status quo through which the award was given” she stated.